Insight Theatre Company closes their season with a unique, respectful production of Thornton Wilder’s American classic, “Our Town.” Some of the finest actors in town come together to tell this small town story of a turn-of-the-century hamlet in New Hampshire as it copes with war, love and marriage and death over the period of twelve years. Thanks to spot-on direction by Tom Martin, this tale comes through for the poignant and significant piece of Americana it is. Joneal Joplin leads the way as the kindly and wise Stage Manager who guides us through the lives and loves of several of the people in Grover’s Corners starting in 1901. While letting us glimpse into these small town lives, he never lets us forget that we’re watching a play but truly experiencing life. We see Doc Gibbs and his family including young George and their next door neighbors, Editor Webb and his family including Emily. We know from the start that George and Emily are meant for each other and the Stage Manger lets us in as this story of their lives progresses through three acts separated by a three year span and then an additional nine years after the second intermission. Jack Dryden is the perfect “aw shucks” kind of young man as George who tends to neglect his homework for his dreams about playing professional baseball. He goes through a wonderful transformation of maturing and learning what he thinks life is all about and this young actor does a great job in showing all of those emotions. We’re used to seeing Taylor Peitz in musicals but she really has the acting chops and brings them to the forefront as Emily Webb. She goes from awkward teenager to a poised woman and then shares a special insight in the final act. It’s a wonderful performance. As her father, Editor Webb, Alan Knoll delights from his sage advice to his future son-in-law to his handling of family problems. Another great St. Louis actress, Amy Loui is wonderful as his wife who also goes through a range of emotions and then is able to show Emily the true path to acceptance during a flashback in the third act. On the other side of the fence, John Contini is a strong force in his family and in the community as Doc Gibbs. He displays the proper wisdom and compassion befitting the role and commands the stage by his very presence. Playing his wife, veteran actress Peggy Billo shines the the role. Her words of wisdom guide her family through the tough times and the good and she offers sage advice to Emily during the final scenes. Lily Orchard is also delightful as the fourth member of the Gibbs family, young Rebecca. Climbing the ladder representing the upstairs bedroom of George, she gets to end Act I with the wonderful Thornton Wilder perspective on the universe in general and the small town of Grovers Corners in particular. A splendid supporting cast includes Michael Brightman as the church organist with a penchant for the bottle, Donna Weinsting as an overly emotional attendee at the wedding of George and Emily and Paul Balfe as a professor explaining the typography and history of Grovers Corners. The entire company combine to make this a memorable production of this American classic. 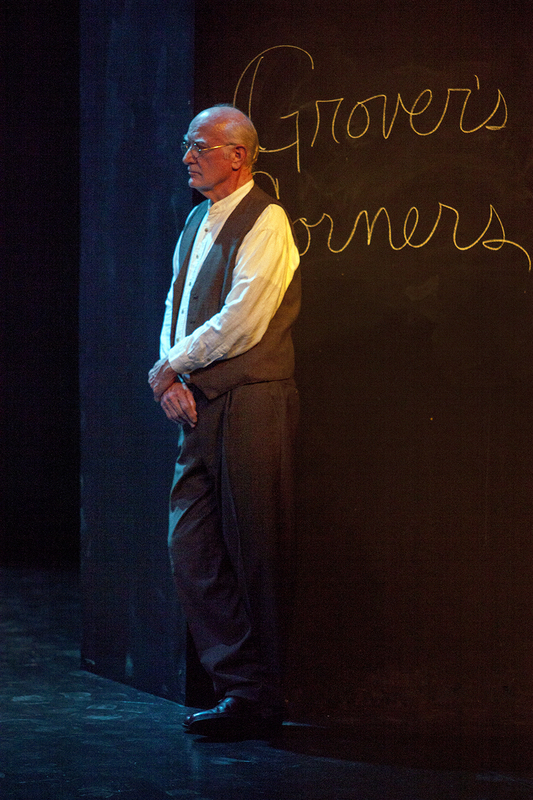 With some unusual touches, director Tom Martin brings a fresh look to “Our Town.” As the Stage Manger opens the show, the town of Grovers Corners appears like a crime scene map from an old detective novel on the blackboard taking up the entire back of the stage. In addition, the name of the town is scribbled on one proscenium while the progression of dates and longitude and latitude of the town is written on the other. It’s a constant reminder that Thornton Wilder intended for the audience to be drawn in completely into small town America. Also, the sound effects for the pantomiming of various activities by the actors are presented on either side of the proscenium arch with the other actors drifting on and off the stage area to provide door slams, bullfrogs “ribbiting” and other occasional reminders that the actors are on a bare stage with minimal taping on the stage to represent the two houses while all other actions are mimed. That bare but effective set design and equally dramatic lighting design to designate areas of action are the product of Mark Wilson. 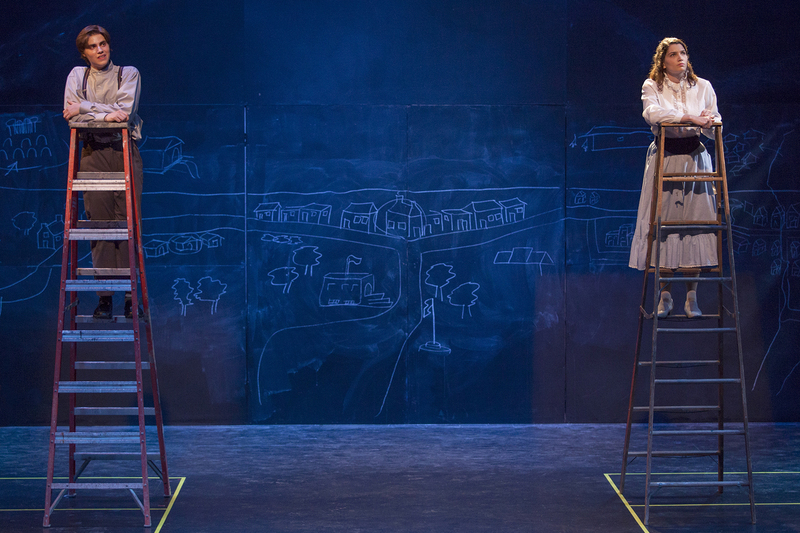 “Our Town” is a remarkable play and Insight has brought us an equally remarkable production. Capturing the feel of small town America at the turn of the century and heeding us to enjoy every minute while on this earth, it refreshes your perspective- if only for a moment. It’s a production to enjoy and immerse yourself in with this incredible cast and perfect homage to play and playwright alike. Contact Insight Theatre Company at 314-556-1293 or online at insighttheatrecompany.com for tickets or more information. 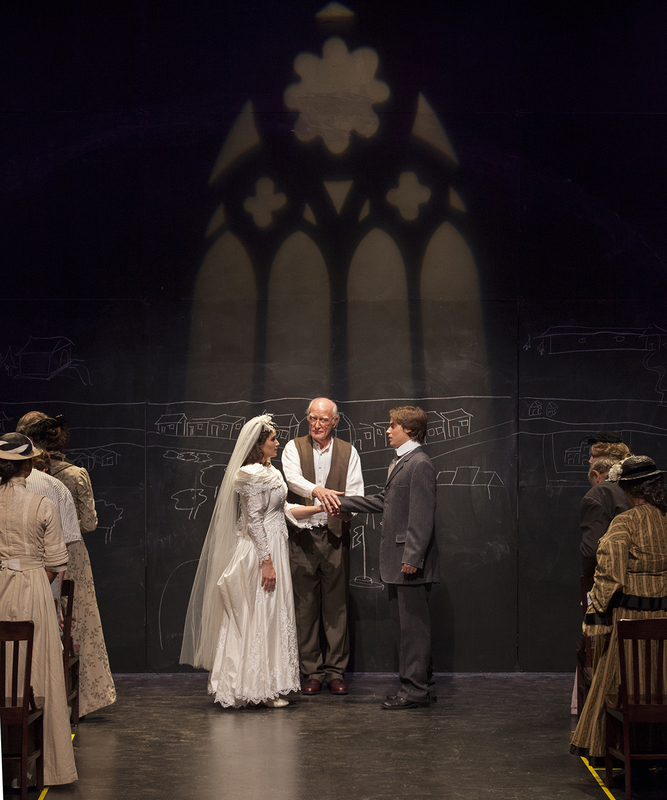 “Our Town” runs through September 29th. This entry was posted on September 13, 2013 at 9:43 pm09 and is filed under Uncategorized. You can follow any responses to this entry through the RSS 2.0 feed. You can leave a response, or trackback from your own site.